Making software for iOS is more than just about writing Objective-C or Swift code: It involves knowing how UIKit works, how certificates are made, how to publish your app to the store, how to deal with app reviews, and more. If you find this eternal task list tiring, some automation in your workflow is exactly what you need. Meet Fastlane, the tool designed to save you minutes or even hours in each deploy. Fastlane helps you automate the process of sending beta builds to Crashlytics, TestFlight, the App Store, and much more. In this article, you will learn how you can use Fastlane to automate your iOS app deployment workflow. Although we will focus on the iOS aspect of this tool, Fastlane works equally well for Android development automation. Or, you can always download Fastlane from the official website. Once you have installed Fastlane, run fastlane init in your project directory and follow the instructions. With Fastlane installed, you can now write Ruby scripts to indicate step by step what you need to do to get your deployment where you want it. This is done using actions, tools, and lanes. Fastlane works by having tools at its core that help you build your app. 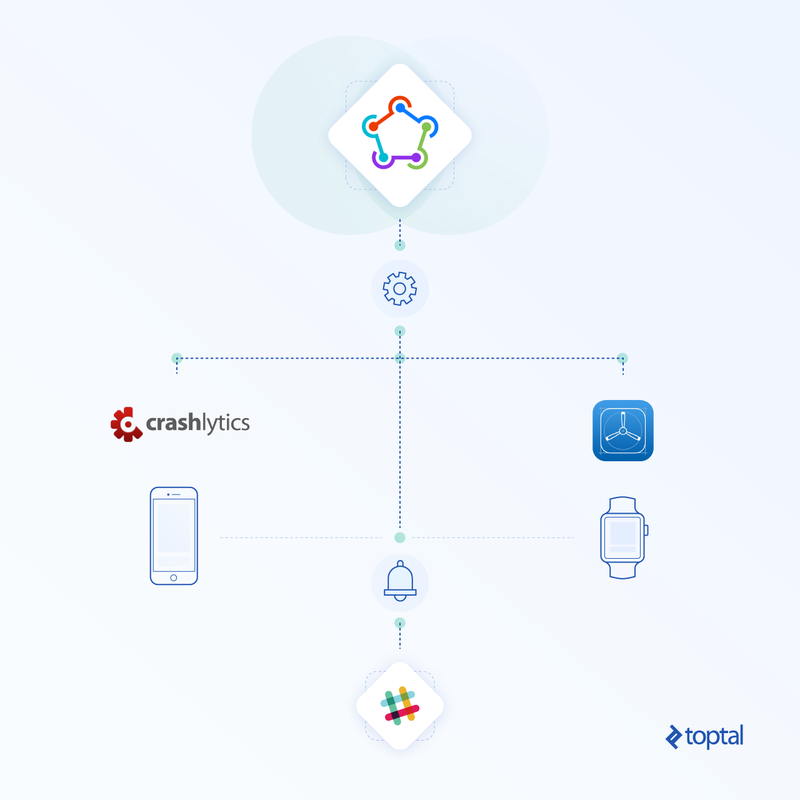 On top of the build tools, there are over 170 built-in integrations with services like Crashlytics, HockeyApp, TestFlight, and more plugins that third parties make and publish so you can connect to other services and more. At its core, you get the main tools that let you do a variety of tasks: From taking automated screenshots to framing them and uploading them to the store, it lets you run all your tests automatically before building the app. Actions are the core tools that Fastlane has, and plugins are a way to add third-party actions to your Fastlane setup. Fastlane uses lanes that essentially group a list of actions or plugins sequentially so that you can achieve the same result every time. When running a lane, each action will export an environment variable, and the following actions will automatically get these variables to keep the process going. For example, using the gym action will result in the path of the .ipa file being generated, and using crashlytics will access this .ipa location to upload this file to its beta service distribution system. You are starting with a new Toptal client who wants a very simple app. The design is already done, and the app can be coded in a few weeks. The next step is to start coding it, and during your the iteration process, you are going to send a beta app every a couple of weeks to the client so that they can see your progress and give you feedback on how things are working. Every time you send a beta version to the client, you are going to go through a basic checklist: signing the app, uploading it to a beta service, adding a new version to it, etc. Add to this the things you have to do once (every year): signing certificates, signing push notification certificates (if needed), and more. With Fastlane, all of these can now happen automatically! For example, you need to create signing certificates and provisioning profiles to share your app via Crashlytics Beta. Create an ad-hoc provisioning profile (attached to the certificate from #1). Save the certificate and the profile from #1 and #2 to a Git repository, encrypted using OpenSSL. First, run fastlane match init to get started and, once you set your Git repo, just call fastlane match adhoc to get an ad-hoc provisioning profile or run fastlane match appstore to get an App Store certificate. Advantages of using match are that you can sync the certificates very easily between computers—and between teammates—without having to revoke the certificates anymore, and the speed that you gain. Just running fastlane match appstore gives you a certificate in a couple of seconds. Well, now we have the certificates and provisioning we need, let’s make a release to Crashlytics. Create the distribution signing certificates. Set your app to use the provisioning profile from #2. Open Fabric and follow the steps to send the app to beta testers. Now, running fastlane beta from your terminal will launch this script. This will first call match, an action that handles creating and updating signing certificates and provisioning profiles, then call gym, an action that builds and packages the app for you, using the same certificates and profiles created before, and finally, crashlytics, which is going to take this signed .ipa and upload it to the Crashlytics service. All of those steps get called, always, in the same order, making the resulting file more predictable and reducing errors. So that was a basic setup for how to run Fastlane to send your app to Crashlytics. What else can we automate? We can, for example, set that each time we are going to send a beta, we want to increase the build version number. Congratulations! You now have an automated deploy script that also increments your build version number. The only caveat is that, once you call this lane, you are going to have files changed in your project (or, at least, the ones that incorporate the build number). In case you were planning to commit that change to the repository anyway, there is an action for that: commit_version_bump. This action commits the files with the new version number. This will commit files with a commit message like this “Version Bump to 27”. Well, if you got this far, you can have an automated deploy to Crashlytics in a very short time that will save you countless hours in the long run. The best part about it is, if you wanted to send your app to TestFlight instead, all you would need to do is change crashlytics to pilot. Fastlane is simple and easy to use. But, it brings amazing value to your regular iOS development workflow by saving you from doing menial things and hours of your time that you would have ended up wasting. I hope you will find this introduction to Fastlane useful. You can check out the official documentation to learn more about Fastlane, especially the list of actions if you are looking for some inspiration on what you could automate for your current and next iOS projects. Fastlane is a tool that automates the release and delivery workflows for your iOS and Android apps. How do I install Fastlane? Francisco is a hands-on technical lead with extensive experience in iOS, Node.js, and web project development. He's a committed, responsible, and hard-working developer who looks forward to tackling new challenges in programming and leadership alike.